Spring at dock and dusk. Oh, to get going again. With the successful completion of right and left eye glaucoma operations out of the way last year, it seems that smooth solar sailing is in store for Spring. That is good, but the operation seemed to precipitate an early arrival of cataracts in both eyes. We are not getting any younger. Around May the lovely admiral goes in for the first of the cataract implants followed 3 weeks later for the second implanted lens. Although the operations are very common, it is critical to keep the inner eye pressures down for the glaucoma repairs that were completed last year. We intend to keep our travels local and low key…. most easily done on the MOG solar electric powered boat. 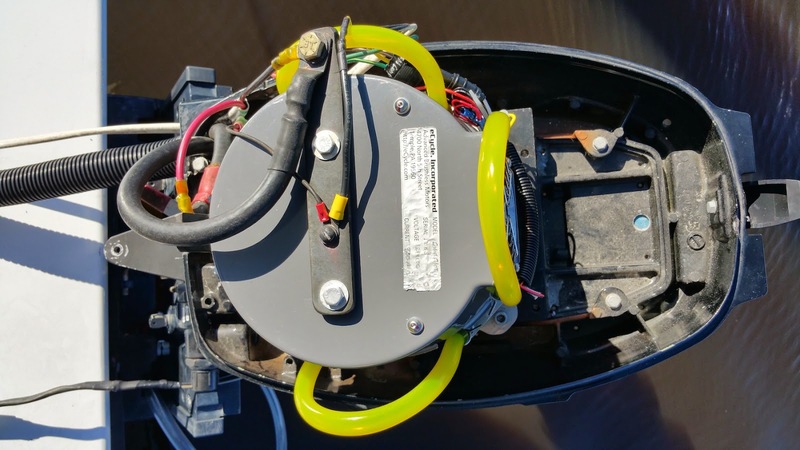 The other two items successfully operated upon are the electric motors that have been updated to the new electronic commutators. Simply put, both have been rewired more neatly to include water resistant connections. The connectors replaced really fat thumbed hodgepodge experiments in bad wiring. The experiments allowed the motors to be tested quickly and disconnected for field changes. With all that behind us, it is time to make a nice schematic and button everything tight and clean. The new set up seems to go into forward and reverse with very good consistency, a long sought goal. The pictures below show some ugly quick wiring that has passed away into sealable push connectors and nice shrink tube insulated solder joints. The motors should still be able to be removed in under 5 minutes and replaced in another 5 minutes. That is kind of a rule with me, to make it easy and make it fast to replace anything. Additional rules are to keep it neat, functional, intuitive and inexpensive to find and fix a problem. Once the few objects under the motor covers are found to be correctly placed, a few wire ties will be placed to keep it all neater. Did I really do this wiring job? Shame on me. Much neater and better protected wiring. Among other improvements are a backup and quick charge battery set for the remote control (RC) unit used for throttle, forward/reverse and differential steering. 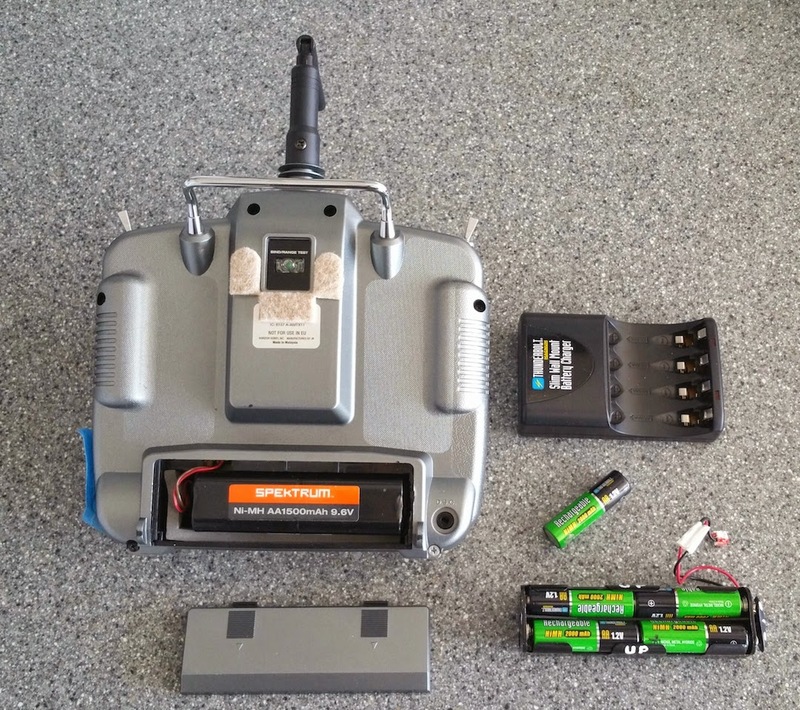 The battery for the unit would only last an hour or two and needed a backup battery and a way to quick charge a spare as well as be plugged in at the helm console for longer durations. 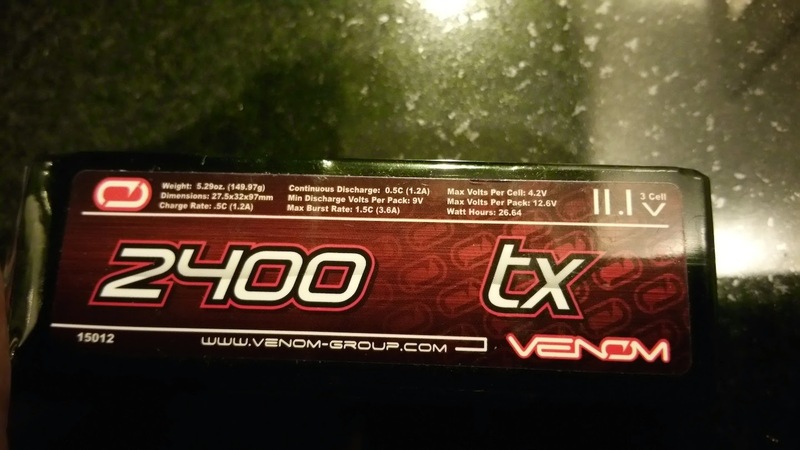 The nickel metal hydride (NiMh) battery that came with the RC was replaced by a lithium polymer (LiPo) battery. Inadvertently, I left the RC on and the new LiPo battery completely discharged… it is now useless. Although days of working the battery with low voltage and low current can bring it back to some semblance of its old capability, it is undependable and a FIRE hazard. Lithium Polymer batteries are high power density but highly subject to bursting into flame, ok for model planes but not live aboard boats. This one is not aboard. LiPo are great for model airplanes (low weight & hi power density) but can literally burst into flame upon charging. 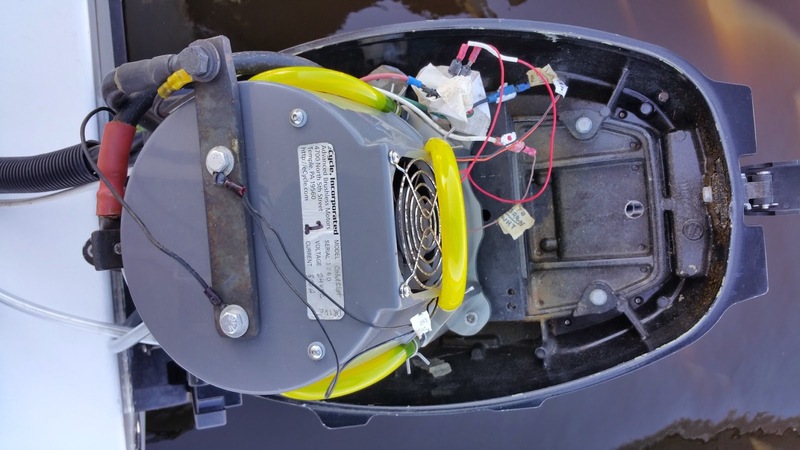 That LiPo battery is way off the boat. Instead I have gotten new rechargeable AA batteries, an 8 battery holder and a small wall type AA (4) charger for them. The new AA batteries are NiMh and create a pack that is of longer life than the original battery. I can also use 7 regular AA batteries in the pack if need be, as well as a dummy set of AA’s through the ship’s 12 volt supply (stepped down to 9.6 V) at the helm for the RC. That way all the bases are covered. Redundancy is key. Previous battery in RC unit with new AA cells in an 8 count holder to the right. The charger is one of two for charging all 8 from a receptacle on board. To say the least, I would prefer everything on the boat to be 12 volts DC but the rest of the world is not there yet. I must use what I can get and make do at this prototype level. Change will come. Travel. Yes the idea is still to travel in the boat to different places throughout North Carolina (this year) in the continuing pursuit of the Great Loop. 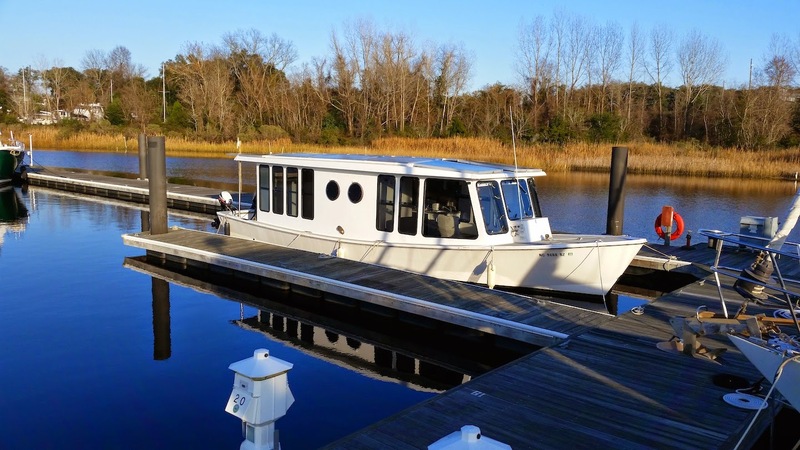 Our first sojourn will be up the river currents of the Cape Fear River. This first trip is to proceed up the Northeast Cape Fear to Lanes Landing then return downstream and turn up the Caper Fear (northwest) and towards Fayetteville, NC. I say towards because it is not only upstream but very conditional when concerning weather. There are three locks to navigate for the nearly 100 mile trip but the locks are littered with tree trunks and navigation is hampered by rain storm flows that easily carry sixty to eighty foot trees into the locks, jamming the workings. The flow rates can go from slow to rampage in just hours, requiring a week of good weather to be safe going up and back down river. The pictures below will give you some idea. North Carolina is a state of geographic extremes. Tallest mountains in the eastern states, sugar sand beaches, beautiful Dismal Swamp, pounding waves for surfing, huge estuaries, incredible golf and fishing, to mention a few. We intend to see (understatement) as much as we can cram into the solar electric powered boat. 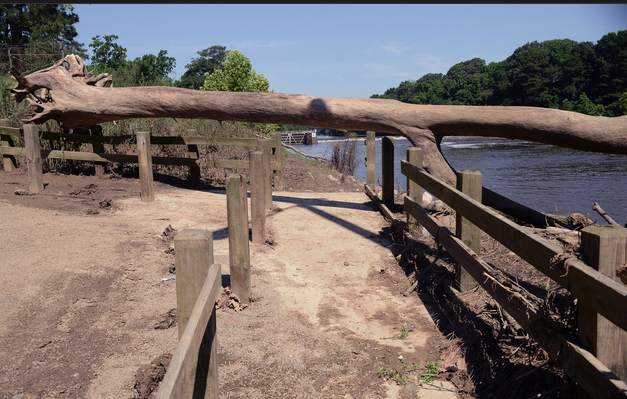 Notice the horizontal tree sticking through the lock guard and nearly two feet in diameter. CAUTION: Objects In Foreground Tend To Be Bigger Than You Can Imagine!!!! Flood water left this tree high & dry. In the background, Cape Fear Lock #1.